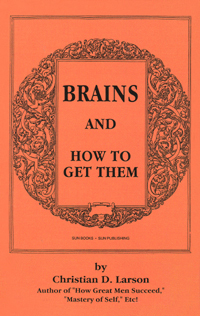 BRAINS AND HOW TO GET THEM by Christian D. Larson. Building the Brain, Making Every Brain Cell Active, Vital Secrets in Brain Building, The Inner Secret, The Finer Forces, Principle of Concentration, Development of Business Ability, Accumulation and Increase, Individual Advancement, The Genius of Invention, The Musical Prodigy, Talent and Genius in Art, Talent and Genius in Literature, Vital Essentials in Brain Building. etc! 233 pgs. 5x8. Paperback. ISBN: 0-89540-382-X. $22.00.